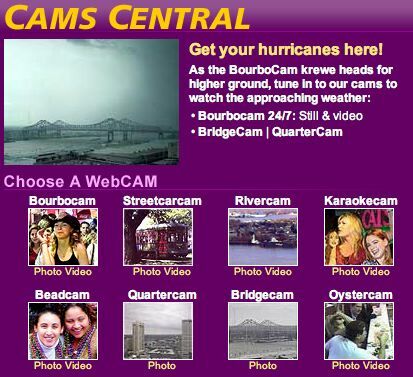 Click on the above graphic to go to some live webcams in New Orleans. Katrina will indeed create waves with storm surges that may very well devestate New Orleans. Hawaii being a similar tourist based area people here can feel for folks there. I should have urged my mom to buy travel insurance, she told me a few months ago she was going to an AARP Convention in New Orleans in September, I did try to stress to her that it was going to be hurricane season and forecasters were predicting a busy season. She’s already planning an alternate trip as she expects the AARP Convention to not happen, it’s going to cost some money to change those tickets. CNN is predicting $70/barrel of crude oil when markets open tomorrow due to the shut-down of many oil rigs in the gulf due to the hurricane. Might want to gas up before prices rise yet again. *UPDATE* Crap, no prediction needed. It’s already Monday in some places and oil is indeed over $70/barrel.